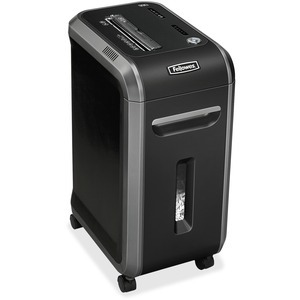 Professional, cross-cut shredder provides powerful professional shredding with jam protection. The 100 percent Jam Proof System eliminates frustrating jams by preventing overloads and powering through tough jobs. SilentShred feature delivers ultra-quiet performance for shared work spaces. SafeSense Technology stops shredding when hands touch the paper opening. Energy Savings System provides optimal energy efficiency 100 percent of the time during use and out of use. Shredder shreds 18 sheets per pass into 5/32" x 1-1/2" confetti particles (Security Level P4) at 12' per minute. You can also shred staples, paper clips, credit cards and CDs/DVDs. Maximum runtime is 30 minutes with a 40-minute cooldown. Sleek, modern design includes an easy-to-empty, 9-gallon pullout bin; 65-decibel sound level; 9" wide paper entry; and casters for easy mobility. 99Ci Jam Proof Cross-Cut Shredder is made of plastic and metal.